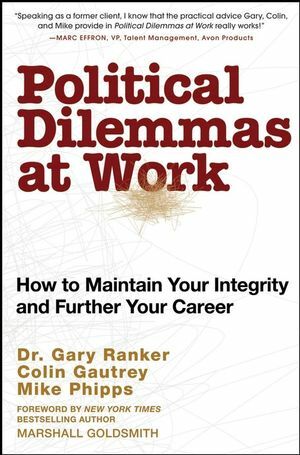 Mike Phipps and Colin Gautrey’s first book, 21 Dirty Tricks at Work, presented the most common political tactics used by individuals in the workplace. This book helped many people around the world handle these tactics in a constructive and assertive manner. What was not tackled were the more strategic political situations that people find themselves in when others exert their power and influence, the type of political campaigns that can leave individuals feeling bemused, fearful and paralyzed. Political Dilemmas at Work will present real political challenges in an original and engaging way - which will be instantly recognizable by any experienced manager. Then, based on the authors' experience of coaching managers and directors, they will offer analysis and practical tools and tips about how to deal effectively in these situations. With the workplace becoming more political and competitive by the day, Political Dilemmas at Work will come to the rescue. This book will become required reading for anyone who is ambitious and wants to ensure that they do not fall foul of negative organizational politics. Gary Ranker, PhD, has coached senior executives in corporate politics for almost twenty years. Forbes named him one of the top five executive coaches in the country. He is a frequent speaker at corporate conferences. Colin Gautrey has coached and mentored executives in global organizations for more than fifteen years and is cofounder of Politics at Work<&trade;>, a specialized consultancy that helps to build influencing skills in the workplace. Mike Phipps is cofounder of Politics at Work<&trade;> and has been coaching and training executives since 1990. Phipps and Gautrey are also the authors of 21 Dirty Tricks at Work. You've always played it straight and got good results. Now you're up against a strong and cunning political rival who seems determined to derail your success. Your boss has moved on, and a successor has yet to be appointed. Suddenly, nobody is quite sure what to do. You've got the inside track on a big issue, and you are bound by confidentialityâ?? but everyone keeps asking anyway. You have a troublemaker in your team who is extremely well connected. You'd like to fire himâ? ?but you can't! You're going to be judged on the success of a project, but consultants with a direct line to the CEO are doing most of the work and getting it wrong. Chapter 6: Tough Act to Follow. Thrilled at your new appointment, you are dismayed to discover that everybody keeps telling you how great your predecessor was, and they seem unable to accept you. Your main political ally has suddenly left the organization, and only now do you realize that you have very few friends in high places. Two powerful people are fighting to win control of your functionâ? ?and you are caught in the middle. Chapter 9: Mr. Nice Guy. Many powerful people keep demanding things of you, and you fear the consequences of saying no. The new guy has arrived and is strongly favored by the CEO. He is creating lots of disruption for your team. Chapter 11: The Emperor Wears Prada. You have a compelling vision and a practical plan that nobody is opposing or resisting. Is this too good to be true? In your new organization, you are unable to make things happen, and are failing to get the results you expect. You were hired to push through change, even if that meant starting a few fires and upsetting people. However, resistance is growing, and your support has vanished. You are outside of the main power circles and find it difficult to influence the right people to get the job done. Your team is spending too much time and energy fighting each other, rather than fighting the competition. Chapter 16: Road to Nowhere. The pressure is on to head up a special project, yet you strongly suspect that it will lead you into a career dead end. Chapter 17: The Status Trap. Your position carries high status which should enable you to get things done, yet you seem powerless to influence those below you. Chapter 18: The Success Trap. You've been highly successful, but suddenly, everything seems to be going wrong. You've accepted a fantastic job. The problem is that you've been toldâ? ?and everyone knowsâ? ?it's only a temporary position. That's when things quickly start to get awkward. The president is due to arrive, and your boss has told you not to reveal a serious flaw in the proposal. He said to use a bit of spin. Chapter 21: A New Charter for Career Success.